Time and again, Washington proved it can never be trusted, consistently breaching promises made, spurning its treaty obligations – operating solely by its own rules, aiming for global hegemony by whatever it takes to achieve its aims. Negotiating with Washington is an exercise in futility, Trump’s JCPOA pullout the latest example, duplicity well understood by Pyongyang – betrayed before by US administrations, wanting a repeat episode avoided. What does Kim Jong-un hope to accomplish? He clearly wants war avoided as do his South Korean and Chinese counterparts. He and his government want to survive. Nuclear and ballistic missile capabilities are his most important deterrents against feared US aggression, a major threat to his country. Why would he sacrifice them in return for US promises sure to be broken? He’s most likely willing to compromise, short of yielding entirely to US demands – not good enough for Washington. China earlier promised to intervene on behalf of the DPRK if it’s preemptively attacked. Mao did in the early 1950s, Xi perhaps willing as well to prevent a potentially hostile US vassal state on its border. Sovereign independent nations have no ally in Washington, the Trump regime a major threat to North Korea and world peace. In 2011, US-led aggression raped and destroyed Libya, Gaddafi sodomized to death, a fate Kim understands, wanting a similar outcome for himself from future US aggression avoided. Mike Pence warned Pyongyang, saying June summit talks will be cancelled if Trump feels he’s being “played,” adding the military option remains on the table. He lied claiming Pyongyang broke earlier promises made to the Clinton and Bush/Cheney administrations. It was the other way around, Washington betraying North Korea. Given longstanding US duplicity, the same outcome is likely ahead. Washington deplores peace and stability. It needs enemies to justify unjustifiable amounts of military spending – with all categories involved, including countless tens of billions of dollars in black budgets, it’s around what the rest of the world spends in total, maintaining its global empire of bases, its special forces deployed in most countries, waging endless wars of aggression against invented enemies. “there was some talk of the Libyan model (earlier). 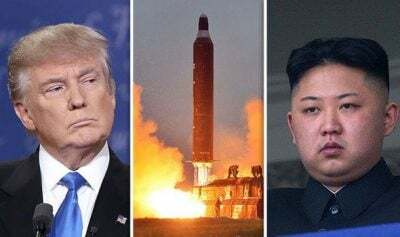 (A)s (Trump) made clear, this will only end like the Libyan model ended if Kim Jong-un doesn’t make a deal” – if he’s unwilling to accept US demands, notably relinquishing his more important deterrent against possible US aggression. A state of war has existed between the US and North Korea since adoption of the uneasy 1953 armistice on the peninsula. America is nuclear armed and dangerous. It wants nations targeted for regime change as weak and defenseless as possible. US treachery is longstanding, negotiating with its regimes a very hazardous undertaking, most often turning out badly for nations mistakenly trusting Washington. It wants unchallenged global dominance, imperial trophies replacing sovereign independent states, North Korea no exception. It’s hard seeing anything positive from Kim/Trump talks if they happen as scheduled – even if they’re portrayed favorably. It’s highly unlikely that Kim will accept US pledges at face value, risking his country’s security if he dares go this way. Hopes were high following adoption of the JCPOA, unanimously approved by the Security Council. Obama breached the deal straightaway. Trump abandoned it. Pompeo threatened the toughest sanctions ever if Iran fails to obey outrageous US demands – presented to be rejected, not accepted. Will Kim/Trump talks end the same way? Given longstanding US duplicity and rage for global hegemony, it’s highly likely.